Annie was still an infant when the family emigrated to Australia as assisted passengers on the sailing ship Calliope. This embarked from Southampton on 3 February 1853 and arrived at Port Phillip in the colony of Victoria on 18 May of the same year. The ship's list records that Benjamin was a shepherd, aged 24 years, Jane was 25, Alfred was three, Herbert was one and Fanny an infant. It also noted that both parents could read and write. Accompanying Benjamin and Jane and their family on the voyage out was Jane's illegitimate son Thomas, then aged 5 years, who was said then and on his subsequent marriage and death certificates to be the couple's son. Also on board was Jane's 20 year-old sister, Emily Bass. The ship's records show that Benjamin and Jane had been contracted to work for a James Egan of the Major's Line station near Heathcote in Victoria for a period of six months for which they were to be paid fifty pounds plus rations (Emily Bass had also been engaged to work for Egan as a domestic servant. She later went to Castlemaine where she married James Oseen, a storekeeper, in 1858. Sadly, she died from the effects of dysentry four years later. Click here to read more about her short life and those of her siblings). James Egan, known locally as 'one-armed Egan' after he lost an arm in a shooting accident in 1847, came from King's County in Ireland and purchased the lease to the Major's Line sheep station - a run of some 5100 acres - in April 1842. He later owned the Wild Duck Hotel near Heathcote. On the year of Benjamin and Jane's arrival, the home block was said to contain 'a good house, kitchen and sleeping rooms, a 12-stalled stable, a store with sleeping rooms attached, a woolshed and stockyards'. Prior to the discovery of gold at nearby McIvor Creek in October 1852, the non-aboriginal population of the area was estimated to be around 400. There may have been as many as 20,000 in the area at the time of Benjamin and Jane's arrival including, according to a visitor to the McIvor diggings, 'the very worst class of humanity. Horse stealing, theft, and robbery with violence were of daily occurrence and, if their victims resisted in an effort to protect their property, there were cases where [the] robbers did not scruple to murder' (cited in J. O. Randell, McIvor: A History of the Shire and the Township of Heathcote (Burwood: Brown Prior Anderson, 1985: 13-14).The same author noted that hordes of miners and others began, from the beginning of 1854, to leave the area for the newly discovered diggings at Maryborough. By 1 June 1854, the population of Heathcote had dwindled to around 2,000 and by year's end there were no more than 800 men still working the McIvor field. 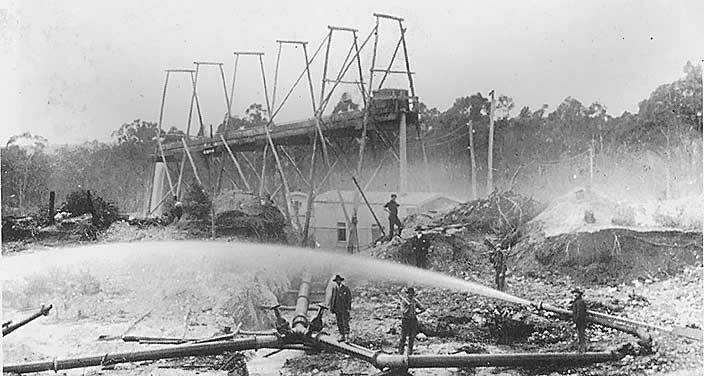 It seems after completing their contract with Egan, Benjamin and Jane also left Heathcote for the Maryborough and later the Ararat goldfields where, like thousands of others, they hoped to make their fortune. Some time between 1854 and 1866, Benjamin died where the versions of what actually happened to him differ slightly. Some in the family thought he died of thirst on the 'Old Man's Plains' while trying to walk to the Orange goldfields in New South Wales. Others thought he was found wandering in a state of delirium on the 'Emu Plains' and was taken to the Ararat mental asylum where he died soon after admission (this was more likely Jane's second husband, William Henry Robinson - see below). Whatever the truth of the matter, there is no official record of Benjamin's death or of his burial - his final whereabouts remains a mystery. ... held before Dr Laidman on Friday, at Bung Bong, on the body of a boy named Alfred Cheeseman, who met his death by a fall from a horse on the previous Wednesday. Deceased was a dairy boy to Mr Moody of Bung Bong, and left home on horseback to get back a bullock, but having been away until sundown, Mrs moody (who gave evidence) went to look for him, and found him lying under a small tree in the paddock not a quarter of a mile from the house. He said he had fallen off the horse and been hurt. The horse - a very quiet animal - had got itself to the paddock by itself. Mrs Moody carried the boy in and laid him on the sofa where he died. Dr South who had made the necessary post mortem examination, proved that the liver was extensively ruptured, which might have been the result of concussion and probably was so. Haemorrhage from the liver was the cause of death. The jury returned a verdict in accordance with the evidence. Herbert was buried in the Protestant section of the Avoca cemetery on 20 September 1962. His death certificate, which was informed by Charles T. Robards, a neighbour from Bung Bong, states that his father was 'Benjamin Cheeseman gardener', and his mother was 'Jane Robertson [sic] (married before to B. Cheeseman)'. This could suggest that Benjamin was alive and working in the area and so had separated from Jane. After the death of her second husband, William Henry Robinson in 1869, Clara Jane went back to Carngham where she lived with her sons Thomas and Alfred and their families until her death at Madden's Flat on 26 November 1888. Her death certificate, which was informed by her eldest son Thomas, stated that she was a labourer's widow, had died from cancer of the uterus, and had been 36 years in the colony. What of Benjamin and Jane's remaining children? Benjamin and Jane's son, Alfred John Cheeseman (1849-1922), had married Jane Elizabeth Wright (1849-1911) in the Church of England at Carngham on 16 May 1870 (the couple are pictured on the left). After living for a time in the Riverina district of New South Wales, they spent the rest of their married lives at Carngham and later Beaufort in Victoria and had thirteen children between 1871 and 1895. Click here to read a more detailed account of their and their childrens lives and times. Alfred's brother Thomas George Cheeseman (1846-1908) was born at Hythe in Kent on 4 May 1846, the illegitimate son of Jane Bass and a local labourer, George Hayward. The 1851 census shows him living at Hythe with his grandparents Thomas and Frances (Harriet) Bass and his uncle Robert Bass, a fisherman. Thomas came to Australia with Benjamin and Jane Cheeseman and their family in 1853 and, like Alfred, eventually settled at Carngham. On 26 September 1867, he married Ann Eliza Cobold (1848-72), the daughter of George Cobold and Sarah Yates, after banns at the local Church of England at Smythsdale in Victoria. He was a labourer and bachelor aged 21 years, she was a 20 year-old spinster. The wedding certificate states that Thomas' parents were Benjamin Cheeseman, a labourer, and 'Jane Robinson (by second husband)' whose maiden name was Bass. It also shows that both Thomas and Eliza were both living at Carngham at the time of the wedding, which was witnessed by Alfred John Cheeseman and Ellen Cobold. Ann Cheeseman nee Cobold died at Carngham in January 1872, we don't think that she and Thomas had any children. The following year Thomas married a widow and seamstress, Sarah Ann Shaw (1848-1922), at the Holy Trinity Church at Carngham on 6 August 1873. Sarah, born Sarah Ann Stokes, came from Little Storton in Bedfordshire in England. Her parents were William and Frances Stokes (nee Bonnett) and she had four children by her previous marriage (one of whom, Margaret Shaw aged 12 years, died of diptheria in 1879). The wedding was witnessed by Thomas' sister, Frances Mary Lucas, and John Stokes. Their certificate of marriage shows that Thomas was then living at Carngham and working as a miner and that his parents were Benjamin Langford Cheeseman, a 'deceased labourer', and 'Jane Robinson, late Cheeseman (Bass)'. The couple lived at Snake Valley and Preston Hill near Carngham after their marriage and had seven children: Thomas Langford Cheeseman (1874-1935), Frances Jane Cheeseman (1877-1966), George Alfred Cheeseman (1880-1964), Charles Cheeseman (1883-1949), Margaret Shaw Cheeseman (1885-1968), Ellen Eliza Cheeseman (1887-1968) and James Robert Cheeseman (1890-1977). Thomas was said to be a carpenter at the time of his death at his residence on Ballarat Road at Preston Hill near Carngham on 8 August 1908. He was buried at Carngham cemetery three days later. His death certificate, which was informed by his son George Alfred Cheeseman, states he was born at Hythe in Kent and had been 58 years in Victoria. His issue at the time of his death were: Thomas Langford (34), Frances Jane (30), George Alfred (28), Charles (25), Margaret Shaw, Ellen Eliza (20) and James Robert Cheeseman (18). After Thomas' death, his widow Sarah lived for a time at Preston Hill before moving to Smythsdale where she died on 4 January 1922. She is buried next to Thomas at the Carngham cemetery. What of their seven children? 1. Thomas Langford Cheeseman, (1874-1935) sometime publican of the United States Hotel at Snake Valley, enlisted in the First AIF and embarked from Melbourne on the RMS ORONTES on 16 August 1916. He served in the 39th Battalion and was wounded in action in France in June 1917. Thomas returned to Australia on 30 April 1919. Before the war Thomas had married a widow, Annie Merifield nee Facey (1864-1949), at Carngham in 1899. Annie was the daughter of Robert Francis Facey and Annie Duffey. She was earlier married to Frederick William Merifield and had at least three children with him - Francis William (1888), Richard Spencer (1892) and Christopher Charles Merifield (1898) - before Frederick's death at Carngham in 1898. A sad drowning fatality occurred at Snake Valley on Saturday; two boys who were returning from a shooting excursion, being the victims. Thomas cheeseman nine years of age and son of the licensee of the United States Hotel, and William Suttie eight years of age left their homes early in the morning and as they did not return in the evening some relatives and friends formed a search party. At about midnight the boys clothing was found on the bank of a water hole known as the blue dam, and in about four feet of water Thomas Charles Suttie stepped on the body of his brother. He lifted it to the surface and then fainted. He also was in danger of drowning but was rescued in time. Cheeseman�s body was then brought up. The bodies were removed to the respective homes where most pathetic scenes were witnessed. The interrment took place on Monday at the Carngham cemetery. There was a large gathering of sympathisers. A verdict of accidental drowning was returned. 1) Eva Lillian Wright (1906-80). Born at Castlemaine Eva married George Malcom Iverson Carr (1900-56), the son of Henry Alexander Carr and Mary Georgina Pratt, St John's Church in East Malvern on 26 September 1942. The electoral rolls show that they lived at 3 Rushmead Street in East Malvern after their marriage. George was said to be an engine driver and Eva a millener. According to the 'Young Family Tree' on Ancestry.com), George died at East Malvern in 1956 and Eva at Dandenong outside Melbourne in 1980. They had at least one daughter we are aware of: Anne Marie Carr who married Frederick Albert Leonard Beauchamp and had four children. 2) Robert Gordon Wright (1908-74). Also born at Castlemaine, Robert married Lorna Winifred Lester (1916-71) in Victoria in 1939. The 'Young Family Tree' on Ancestry.com has Lorna's parents as Norman James and Ruby Winifred Lester. The 'Descendants of William Robertson' on Ancestry tells us that Ruby's maiden name was Menzies and Robert and Lorna had two children both still living. 2) Ivy May Cheeseman (1908-84) who married Alan Edgar Bell (1913-83), the son of James Anthony Bell and Nellie Madge Plumridge (who were married in Victoria in 1912). Trevor Cheeseman tells us that Ivy 'ran a shoe shop in Euroa for many years. She married Alan Bell and they were childless, both dying in Euroa about the early 1980s'. Another instance of the danger of carelessly handling firearms was shown in the accident that befell Chas Cheeseman last week. The lad, who lives at Snake Valley, was knocking the muzzle of a loaded pistol against his hand when it exploded and the shot travelling across his hand made a very nasty wound. Dr Hoys said at first thought, the hand would have to be amputated, but now expects to be able to save it if it continues to heal up properly. Charles survived the accident and married Emily (Emma) Beatrice Gardiner (1885-1950), daughter of John Morris Gardiner and Grace Adelaide Mark, at Carngham in 1902. The Australian electoral rolls show that they lived all their married life at Snake Valley where Charles owned a house and worked as a labourer and miner. They also had eight children there: 1) Grace Adelaide Cheeseman (1902-04); 2) Annie Irene Cheeseman (1906-60) who married Gilbert Ringin (1907-74), son of local farmers John and Caroline Ringin nee Corbett, and had at least twelve children: Dulcie Maud, Thelma Joyce, Edna Beatrice, Shirley Isobel, Gladys Caroline, Alan Charles, Emma Dawn, Gilbert Maxwell, Keith Thomas, Beverley Ann, Valerie Margaret and Carol Jean Ringin; 3) Emma Beatrice Cheeseman (born at Skipton in 1908) who married David Slater, the son of John Henry Slater and Isabella Lavinia Wilkie. 4) Edith Joyce Cheeseman (1912) who married William James Mark; 5) Charles Thomas Cheeseman (1914-75); 6) William Cheeseman (1919) who married Una Elizabeth Quilliam); 7) Alfred John Cheeseman (1922-69) who married Daphne Josephine Daniels (1927-74) who, according to the 'Daniels Family Tree' on Ancestry.com was born at Skipton and was the daughter of Norman Daniels and Ellen Frances McGregor; and 8) Donald Philip Cheeseman who, according to the Australian electoral rolls and other sources, worked as an engineer and later a pioneer farmer at Kurangi near Port Douglas in northern Queensland. 5. Born at Carngham, Margaret Shaw Cheeseman (1885-1968) married Thomas Formby (1876-1950) there in 1905. We believe that Thomas was born at Scarsdale in Victoria and his parents were John Formby (1831-1902) and Sarah Elizabeth Swendell (1843-1909) who were wed in Melbourne in 1867. The Australian electoral rolls show that Thomas, who was then working as a storeman, and Margaret lived at Smythsdale in Victoria (the home town of Thomas' mother Sarah Elizabeth) until around 1930 when they moved to the Melbourne suburb of Auburn. Thomas died in Melbourne in 1960, Margaret there in 1968. They had two children we are aware of: 1) Elsie Maud Formby (1906-83) who, according to the 'Town Family Tree' on Ancestry.com, married Samuel Vincent Town (1905-72), the son of Samuel Town (1880-1957) and Annie Louisa McCulloch (1879-1917) and had three children all still living; and 2) John Raymond Formby (1908-72) who worked as a decorator and, the 'Duggan Family Tree' on Ancestry.com tells us, married Maria May and had at least three cildren: Gwen Marlene Formby who died in 1934, Raymond James Formby who died in 1932 and Noel Raymond Formby (1938-41). 6. Ellen Eliza Cheeseman (1887-1968) married Thomas Doig Suttie (1883-1963), the son of Robert Suttie and Elizabeth Swinton, at the Scots Manse in Ballarat on 16 April 1913 (they are pictured in the photo on the right which was sent to us by their granddaughter-in-law Bev Howlett). A copy of their wedding certificate, also supplied by Bev Howlett, shows that Thomas was born at Carngham but was living at Wentworth in NSW at the time of the wedding and working as a labourer. Ellen, a 25 year-old spinster, was living with her parents at Carngham. The marriage was witnessed by Ellen's younger brother James Robert Cheeseman. The Australian electoral rolls show Thomas, a labourer, and Ellen were living at Snake Valley in 1931, Newtown near Smythesdale in 1936, and Scarsdale from at least 1943 to 1954. Bev Howlett tells us that Ellen and Thomas had seven children: John Ernest (1908-53) who was adopted and, we believe, was twice married, Thomas David (1921-76) who is buried at Linton with his wife Joan, Robert Thomas ('Bob') who is buried in Darwin, Thelma Ann (1917-97) who is buried with her husband Sydney Howlett (killed in a motor cycle accident in 1955) at Linton, Phyllis who lives at Portland, Jean who is buried at Elaine with her husband, and Langford George Suttie who is buried at Ballarat. 7. James Robert Cheeseman (1890-1977), who was then living at Preston Hill in Snake Valley and working as a labour, married Gertrude May Gardiner (1894-1970) in 1914. 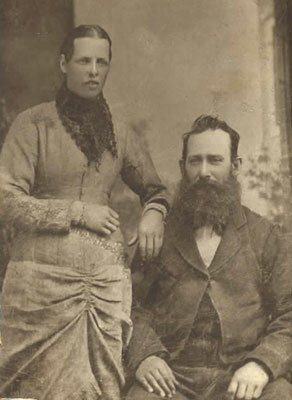 Ancestry's index of Australian bdms shows that Gertrude was born at Majorca in Victoria, the daughter of Edward Gardner and Sarah Ann Burdett, and died at Ballarat, aged 76 years (she is buried at Carngham with her husband). Two of Gertrude's brothers - Albert and Herbert Gardner - died on active service in France during the First World War. 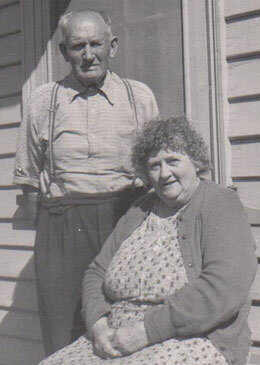 The Australian electoral rolls show that James and Gertrude lived all their married lives in the Carngham/Snake Valley area where they had six children we are aware of: Clarice Hazel, Phyllis May, Gladys Helen (1919-22), Allan Graham (1935-73), Edward Thomas and Lorna Beryl Cheeseman. Alfred and Thomas' sister, Frances Mary Hannah ('Annie') Cheeseman (1852-1919), was born in St Leonard, Hythe in the county of Kent on 13 December 1852. In May 1853, she emigrated with her family to Port Phillip in Victoria on the Calliope. Annie married Nathaniel Lucas (1844-1932) at the Church of England, Carngham on 5 December 1870. She was a domestic servant aged 17 and he was a bachelor and wood splitter aged 25. The marriage was witnessed by Frances' brother Thomas Cheeseman and a Hannah Jane Lucas. Frances' mother, Jane Robertson [sic], had provided written permission for her daughter to marry. Nathaniel Lucas was born at Everton in Tasmania in 1845 and moved to Victoria with his family when he was nine years old. His parents were James Lucas, a wheelwright, and Elizabeth Sides. James was the son of two First Fleet convicts: Nathanial Lucas (born at Kingston in Surrey in England in 1764) and Olivia Gascoyne (Severn Stoke, Worcester, England, 1763) who were married on Norfolk Island in 1791 and moved to Liverpool where the elder Nathaniel died in 1818. Details of Nathaniel and Annie's family are given on the Lee family history website, and Ross Gammon's 'Gammon' site on Rootsweb (dated 11 April 2006). Mrs Frances Mary Lucas (wife of Mr Nathaniel Lucas) of Vaughan Street died on Saturday, aged 67, the cause of death being broncho-pneumonia. The deceased, who was born in Kent England, was held in great esteem by a large circle of friends. She leaves a family of three sons and four daughters. The funeral took place this afternoon at the Shepparton cemetery. Annie's death certificate records that her parents were William Cheeseman and Jane Cheeseman (formerly Bass) and that her children at the time were: Annie Elizabeth (aged 47), Nathaniel Henry (43), Elizabeth Jane (41), Frances Amy (38), Mary Ann Olive (deceased), James Herbert (34) and Thomas Charles Alfred (deceased). The Australian electoral rolls show that Nathaniel continued to live at 60 Vaughan Street in Shapparton until his own death there on 18 July 1932 aged 87 years. 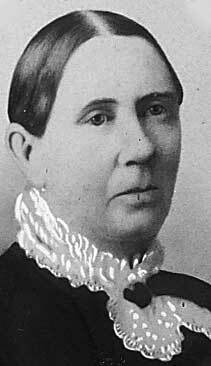 Annie Elizabeth Lucas (1872-1953) was born at Sebastopol and married her cousin, John Samuel Lucas (1869-1921) at Shepparton in 1896. Ancestry's index of Australian bdms and the 'Lucas/Gascoinge' family tree on Ancestry.com show that John was born at Sebastopol in Victoria, the son of John Lucas (1836-1916) and Bridget McCullen/McCallum (1840-1881). John died at Mooroopna in Victoria in 1921, Annie Elizabeth in the Melbourne suburb of Cheltenham in 1953. She and John had five children we know of: 1) Percy William Lucas (1897-1968) who married twice, first to Ruth Mary Paterson nee Wilson at Sepparton in 1924 and, in 1953, to Anne Radford; 2) John Andrew Lucas (1904-66) who we think married Ivy May Hocking at Shepparton in 1933. The Australian electoral rolls show that John worked as a blacksmith and that he and Ivy lived most of their married lives in Melbourne, initially in North Melbourne and later Boronia; 3) Esther Emily Mary Lucas (1906-60) who married Wagland Leslie Kerr and had at least one son, Ronald Robert Kerr (1932-72); 4) Reginald Roy Nathaniel Lucas (1911-87) who married Ivy Florence Trewin (1909-83) at Shepparton in 1935; and 5) Amy Doris Lucas. Nathaniel Henry Lucas (1876-1937) was born at Carngham and married Louisa Jane Britton (1877-1929), the daughter of Robert Britton and Eliza Victoria Sivyer, at Mooroopna in Victoria in 1897. The Australian electoral rolls show that Nathaniel, who worked as a labourer, and Louisa Jane lived all their married lives in Shepparton where they had ten children: 1) Frances Jane Lucas (1898-1966) who married John Edward Frederick Kenny (1890-1967), the son of John Kenny and Phoebe Jane Francis, in South Melbourne in 1922. The electoral rolls show they lived at Shepparton until the mid-1930s when they moved to Melbourne; 2) Ivy May Lucas (1900-43) who married Frabk Herbert Crouch (1897-1953), son of henry William Crouch and Patience Louise Caudwell, and had at least three children; 3) Sarah Emily Lucas who, according to Peter McKay's Rootsweb site the 'Lucas Clan in Australia', married William Alexander Stewart Irving and had three children; 4) Nathaniel Robert John Lucas (1906-76); 5) Gladys Marjory Horkings nee Lucas; 6) Annie Olive Hughes nee Lucas (1910-71); 6) Thomas Henry Lucas (1912-78) who married Dorothy Hein Jones; 7) Linda Lucas who died in Shepparton as an infant; 8) Nellie Harcourt Lucas and Millie Hazel Lucas. Details of Nathaniel and Louisa's family can be seen on Bernadette Dowling's Rootsweb site 'Kenny/Dowling' (last updated 30 April 2006). Elizabeth Jane Lucas (1878-1947) who was born at Carngham and married Gilbert Ernest Dean (1875-1961), the son of Richard Dean and Marion Emily Heale, in 1903. The Australian electoral rolls show that Gilbert worked as a labourer and orchardist and that he and Elizabeth lived at different times in Melbourne and on the Mornington peninsular. The electoral rolls and other sources indicate they had at least six and possibly eight children: Irene Dowling, Robert, Florence Edith, William Ernest, Herbert Nathaniel Richard, Jack Ronald Oliver, Maud Frances Emily and Gilbert James Aneas Dean. Frances Amy Lucas (1881-1964) married Walter Robert Paisley (1874-1949), the son of James Paisley and Margaret Casey in Victoria in 1901 probably at Shepparton although that has still to be confirmed. Ancestry's index of Australian bdms shows they had two children in Shepparton - Olive Millicent 'Milley' Paisley in 1902 (Milley died in New Zealand in 1916) and Walter James Cardigan Paisley in 1903 - and a daughter, Frances Mabel Paisley, at Camperdown in Melbourne in 1905. Sometime after this the family went to live at Christchurch in New Zealand where, according to the NZ online index of births, they had a son, Nathaniel Keith Paisley, in 1908 (sadly the boy died at Christchurch the following year). The NZ electoral rolls show Walter, who was working as a stoker, and Frances Amy Paisley were living at 59 Essex Street in Linwood in Canterbury at the time of the 1911 election. In 1914 Walter, who was then a gas works employee, and Frances were living on Nursery Road in Linwood. After this they lived in the Christchurch suburbs of Sydenham and Avon where Walter worked as a seaman and fireman. He died at Christchurch in 1949. Frances Amy Paisley nee Lucas died there in 1964. They had five children we are aware of, the four already mentioned and John Chester Paisley who, according to the NZ Army WWII Nominal Rolls, worked as a polish maker and lived on Cumberland Street in the Christchurch suburb of Richmond before he enlisted. The post-War electoral rolls show John Chester, a car painter, and an Iris Pearl Paisley were living in Ashburton in Canterbury. John's older brother, Walter James Cardigan Paisley, who had married Lucy Mildred Brown in 1927, lived at Springburn in Canterbury where Walter worked as a labourer. He and Lucy had at least one son, Edward Keith Paisley. Although still to be confirmed, we think that John and Walter's sister, Mabel Frances Paisley, married Arthur Raymond Clark at Christchurch in 1926. Mary Ann Olive Lucas (1883-1910) was born at Waterloo and died at Sheppaton in Victoria. She seems to have had two boys, Alfred Henry (1904-4) and Nathaniel Harold Lucas (1909-64). James Herbert Lucas (1885-1950) who married Kathleen O'Connor (1886-1972) in 1906 probably in Melbourne although this has still to be confirmed. The Australian electoral rolls show that James Herbert, a fireman, and Kathleen lived in North Melbourne until some time after 1924 when they moved to the nearby suburb of Coburg where they resided at 26 Wattle Grove. They had four children we are aware of: 1) Margaret Mary Frances Lucas (1908-37) who married John Lorimer Gartlan (1904-85) in around 1933 and had one son, also named John Lorimer, before her death at Fitzroy in 1937. According to the 'James & Gartlan Family Tree' on Ancestry.com, John's parents were John Francis Gartlan (1874-1952) and Ellen Priscilla Hogg (1873-1960) who were married at South Melbourne in 1903. He had three siblings: Clement Peter Gartlan (1907-87), Constance Marie Gartlan and Veronica Frances Gartlan (1911-78); 2) James William Nathaniel Lucas (1909-98) who we believe married Mavis Maude Elizabeth Doughty; 3) Harold Nathaniel Lucas (1912-84) who married Jean Taylor and had at least two children, Yvonne and Harry Lucas; and 4) Olive Lucas who, the Australian electoral rolls show, was living at 26 Wattle Grove at the time of the 1949 and 1954 elections and was a textile worker. 'Butcher's stockyard and hut and stores at the McIvor diggings, c1852': drawing by Edward La Trobe Bateman (1816-1897). nla pic-an6617903. Jane Cheeseman (nee Bass) and Alfred John and Jane Elizabeth Cheeseman nee Wright, private collection. Thomas and Ellen Eliza Suttie nee Cheeseman, courtesy of Bev Howlett. 'Mining at Snake Valley', from Hugh Anderson, The Flowers of the Field: A History of Ripon Shire (Melbourne: Hill of Content Publishing Company, 1969).